Pressure drop or head loss is proportional to the velocity in valves or fittings. For the most engineering practices it can be assumed that pressure drop or head loss due to flow of fluids in turbulent range through valves and fittings is proportional to square of velocity. To avoid expensive testing of every valves and every fittings that are installed on pipeline, the experimental data are used. For that purpose resistance coefficient K, equivalent length L/D and flow coefficient Cv, Kv are used. These values are available from different sources like tables and diagrams from different authors and from valves manufacturers as well. Resistance factor K calculation for elbows, bends, tees, pipe entrance, pipe exit, pipe reducers, pipe enlargement. The head loss due to resistance in valves and fittings are always associated with the diameter on which velocity occurs. The resistance coefficient K is considered to be constant for any defined valves or fittings in all flow conditions, as the head loss due to friction is minor compared to the head loss due to change in direction of flow, obstructions and sudden or gradual changes in cross section and shape of flow. The ratio L/D is equivalent length in pipe diameters of straight pipe that will cause the same pressure drop or head loss as the valves or fittings under the same flow conditions. As the resistance coefficient is K is constant the equivalent length L/D will vary inversely with the change in friction factor for different flow conditions. For geometrically similar valves and fittings, the resistance coefficient would be constant. Actually there are always smaller or bigger geometrical non similarity in valves and fittings of different nominal size, so the resistance coefficient is not constant. The resistance coefficient K for a given type of valves or fittings, tends to vary with size as does friction factor for straight clean commercial steel pipe at the same flow conditions. Some resistances in piping like sudden or gradual contractions and enlargements, as well as pipe entrances or exists are geometrically similar. Therefore the resistance coefficient or equivalent length L/D is for these items independent of size. The values for resistance coefficient or equivalent length L/D are always associated with internal pipe diameter where the resistance is occurring. where subscript "a" defines K and d with the reference to internal pipe diameter, and subscript "b" defines K and d with the reference to the internal diameter for which values of K can be found in tables or diagrams. This equation can also be used if the piping system has more than one size of valves and fittings to express the resistance coefficient or equivalent length L/D in terms of one size. In other words, if angle of divergence is bigger than 45O, the resistance coefficient is equal to one for sudden enlargement. should be used, with above equations. Equations for gradual enlargement and contraction can be used for resistance coefficient calculation for reduced bore straight-through valves like ball valves and gate valves. The total resistance coefficient for this type of ball and gate valves is the summation of resistance coefficient for gradual contraction and gradual enlargement. You can calculate resistance coefficient using resistance coefficient K and equivalent length l/d calculator. Calculate flow coefficient Cv or Kv for known flow capacity and pressure difference. Calculate maximum flow capacity of control valve for known flow coefficient Cv or Kv and pressure difference. Calculate pressure difference for known flow coefficient Cv or Kv and flow capacity. Selecting the correct valve size for a given application requires knowledge of process conditions that the valve will actually see in service. In the industry of control valves it is practice to use flow coefficient and flow characteristics. To aid in establishing uniform measurement of liquid flow coefficients Cv, standardized testing facility by Fluid Control Institute (FCI) are used by manufacturers. The effect of viscosity of fluids other than water should be considered when selecting the valve, as increased viscosity of fluid is reducing the valve capacity. Another coefficient Kv is used in some countries, particularly in Europe and is defined as flow rate of water in m3/h that creates pressure drop of 1kg/cm2 across the valve (1 kg/cm2 is equal to 0.980665 bar). Flashing or cavitation inside a valve can have a significant influence on valve capacity. Flashing and cavitation can reduce the flow through valve in many liquid services. Also, damage can be made to the valve as well as to the piping system. The effect is represented by the change from liquid to vapor state of fluid, resulting in the velocity increase downstream from the valve. As liquid passes through the restriction area inside the valve flow stream is contracted. The smallest cross section area of stream is just downstream of the actual physical restriction at a point called vena contracta. At that point the velocity is at its maximum and pressure at the minimum. As the fluid exits the valve, away from vena contracta, velocity decrease and pressure increase, so the critical point for flashing and cavitation is at the point where the pressure is smallest which is in vena contracta. If pressure at vena contracta drops bellows the vapor pressure of the fluid, due to increased velocity at this point, bubbles will form in the flow stream. If pressure downstream of the vena contracta increase above the vapor pressure, bubbles will collapse or implode producing cavitation. Cavitation releases energy and produces a noise. If cavitation occurs close to solid surfaces, the energy released gradually wears the material leaving the rough surface. Cavitation can also damage the downstream pipeline, if at that place the pressure rises above the vapor pressure and bubbles collapse. This equation can be used anytime outlet pressure is greater than the vapor pressure of the liquid. 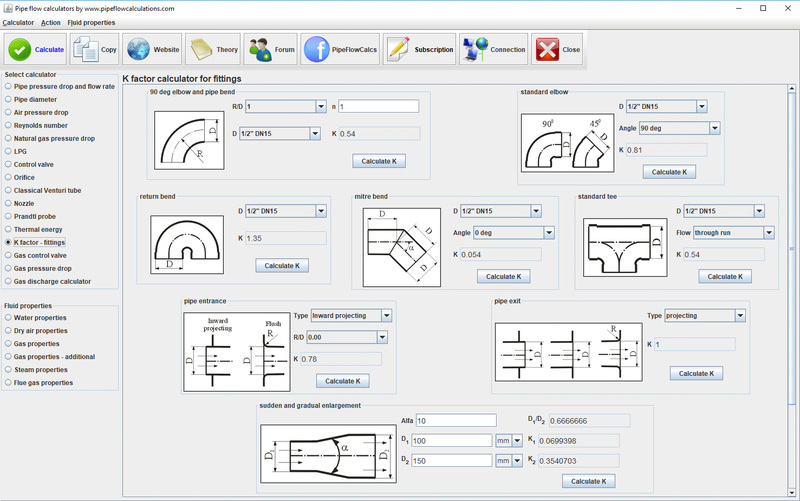 Calculate orifice plate diameter, discharge and expansion factor. Applicable for liquids and ideal gases. With orifice plate calculator you can calculate flow rate for measured pressure drop. Calculation is according to ISO 5167. The values of hL and Δ p are measured differential static head or pressure before and after the nozzle or orifice. Values for coefficient of discharge or flow coefficient (C or Cd) can be calculated based on applicable standards like ISO 5167 or similar ASME standards. Calculate flow rate through Venturi tube based on the created pressure drop by Venturi effect. Calculate velocities on inlet and throat of Venturi tube. Calculate Venturi effect on pressure and velocity in Venturi tube. Applicable for liquids and ideal gases. Calculate flow rate through Nozzle based on the created pressure drop by Venturi effect. Calculate velocities on inlet and throat of Nozzle. For liquids and ideal gases. The expansion factor Y depends on the specific heat ratio χ , the diameter ratio β and the ratio of downstream and upstream absolute pressures. This equation is applicable for the same range of diameter and Reynolds number as for coefficient of discharge Cd indicated above. Formula is applicable only for pressure ratio p2/p1 > 0.75. This equation can be used for gas flow though the orifice and discharging to the atmosphere. For that purpose the pressure difference equals to the upstream gauge pressure. This applies only if absolute atmospheric pressure divided by absolute upstream pressure is bigger than critical pressure ratio for sonic flow conditions. When the smoothly convergent nozzle is used compressible fluid can reach the speed of sound at minimum cross section or throat, if upstream pressure is high enough. When the velocity of compressible fluid reaches the speed of sound, maximum flow has been reached, and increase of upstream pressure or decrease of downstream pressure will not increase the flow any more. For short tubes where relation L/D is not bigger than 2.5 the flow of discharge to the atmosphere can be calculated using above equations, with flow coefficient C somewhere between the values for orifice and nozzle. If the entrance to the short tube is well rounded then the flow coefficient C for nozzles can be used and if the pipe entrance is square shaped and sharp then flow coefficient C for orifice is more appropriate. This equation can be used for discharge calculation from pipes, fittings and valves when resistance coefficient K, static head difference hL and internal pipe diameter d is known. The resistance coefficient is the sum of all resistances in the piping system. Calculate gas flow rate when discharging from pipe or reservoir. Calculation of gas outflow through pipe, valve or orifice in reservoir. Chocked flow condition check included. Calculate flow coefficient Cg or Kg or maximum capacity of control valve for known upstream and downstream pressure. Calculate pressure drop that control valve is creating for known flow rate and flow coefficient Cg or Kg. With above equations when flow coefficient Cg or Kg from gas pressure regulator manufacturer is known, regulator capacity can be calculated for given pressures upstream and downstream from gas regulator. It can be concluded that if pressure of gas before and after the regulator are higher, capacity of regulator will also be higher for the same type and dimension of regulator. When flow rate through regulator is critical, pressure downstream of the regulator doesn't influence the regulator capacity. It is important also to notice that for different type of gases that have different value of density, capacity of regulator will also change, and for gases with higher densities, flow rate will be smaller and volume capacity will drop. All equations are for regulators with fully opened control element, as flow coefficient are measured for fully opened regulator. Capacities for different positions of control element in regulator are calculated related to the curve of appropriate regulator.